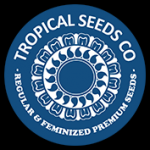 Tropical Seeds - Smooth Smoke Feminised Seeds. Free US delivery. Smooth Smoke has 25% Nepal Highland genetics together with 75% Pakistan Chitral Kush. It is an indica dominant strain, which is reflected in its appearance, and one which is prized for its medicinal benefits including pain relief. Smooth Smoke forms hard, dense, purple buds which are liberally coated with THC-bearing resin. Smooth Smoke is better for indoor cultivation unless grown in warm climate regions such as Mediterranean countries. Flowering takes somewhere in the region of 55 - 60 days with yields that can be high, especially when the plants have vegged for at least one month before flowering is begun. Its flavour is sweet reminding one of candy, vanilla and some ripe red fruits along with a very hash-like background taste.